Financing college and grad school these days is no small task. With tuition costs rising every single year, graduates today are exiting school with laundry lists of student loans. Each one with a different rate, a different servicer, and often with different terms. Sounds confusing, no? The Federal Direct Consolidation Loan repays your existing federal student loans and replaces them with one loan at a fixed rate. This can be beneficial for a few reasons. It reduces the number of loan servicers you’ll need to deal with, replaces variable interest rates with fixed, and helps you qualify for flexible repayment options your original loans may not have been eligible for. The direct consolidation loan replaces your outstanding federal loans with one combined loan at a fixed rate. This can be very convenient. Loan servicers are prone to making clerical errors, so dealing with only one will probably make your life a whole heck of a lot easier. The interest rate is based on a weighted average of the loans being consolidated, rounded up to the nearest 1/8th of 1% with no cap. This rounding calculation is important to keep in mind, since it could mean you’ll pay slightly more in interest. As you can see, your interest rate and monthly payment spiked a tad due to the rounding difference. If you were in this situation, you’d need to weigh the benefits to consolidation against the drawbacks. Keep in mind that if your loans are in default you’ll need to meet certain requirements before you can consolidate them. You should explore consolidation as soon as you graduate, leave school, or drop below half-time enrollment. This is because your “forgiveness clock” will reset with each consolidation. For example, let’s say you’ve worked at a non-profit for five years and are shooting for public service loan forgiveness. You need 120 qualifying payments for forgiveness, and after five years you’ve made 60. If you decided to consolidate, the direct consolidation loan would repay your existing loans and issue you a new, combined loan. Since you hadn’t made any qualifying payments toward your new loan, you’d start over from scratch and need to make another 120 qualifying payments. For this reason, it’s best to develop your repayment strategy as early as possible, since consolidation could easily be part of it. Just remember that if you consolidate your loans during your grace period, the resulting consolidation loan will immediately be in repayment. If your existing loans are at variable rates and you want to replace them with fixed, a consolidation loan will do the trick. If you’re considering a certain repayment option and have loans that don’t qualify for it, you can replace them with a consolidation loan. That said, PLUS loans made to parents of dependent students cannot be transferred to the student through consolidation. That means a student who’s applying for consolidation can’t include PLUS loans taken out by their parents. But, parents may consolidate the PLUS loans they took out to fund their kids’ education. Keep in mind that consolidation doesn’t make these loans eligible for income driven repayment plans they wouldn’t be eligible for individually. If you’re a parent and want to use an income driven plan, Income Contingent Repayment is your only option. If you’re planning on forgiveness (either through PSLF or an income driven repayment option) and have already made qualifying payments, you probably won’t want to reset the clock. This depends on the situation though, so make sure to weigh your options. For example, Federal Perkins Loans have 5 year cancellation benefits if you work in certain professions. Others might have principal loan rebates or interest rate discounts you don’t want to lose. 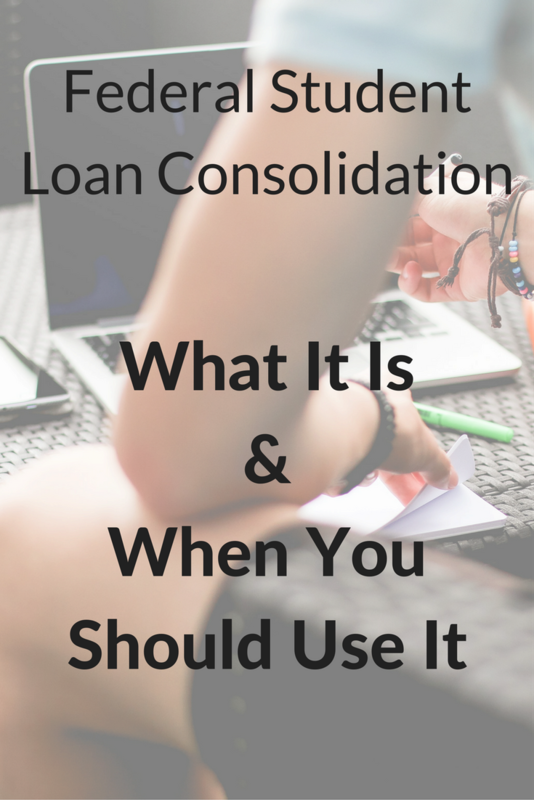 Although these factors might change your consolidation plans, keep in mind that you don’t need to consolidate all your loans. You can include or exclude whatever loans you want. Just make sure to keep good records and paperwork. Consolidation is permanent, so make sure you know what you’re getting yourself into before you pull the trigger. Go to studentloans.gov and submit an application. The process should take about 30 minutes. Again, be sure to keep a paper trail of everything – especially if you’re not consolidating all your loans or are consolidating them separately. You never know when a loan servicer will make a mistake. Some borrowers have reported being contacted by various businesses offering to help them get a federal direct consolidation loan for a fee. DO NOT HIRE THEM. Direct consolidation loans are FREE, and easy to sign up for yourself online. Finally, remember that the Federal Consolidation Loan is completely different than private loan consolidation. Private refinancing & consolidation is a whole different ballgame. Posted in Financial Planning, Student Loans and tagged consolidation of student loans, fed student loan consolidation, federal direct consolidation loan, federal loan consolidation, federal student loan consolidation, federal student loans consolidation, how to do you consolidate student loans, loan consolidation, student consolidation, student loan consolidation, student loan federal consolidation.